Scent Web is a patented scent, wick and a delivery system all in one. Simply put, Scent Web is an environmental-friendly spray string that is scented with deer lure and attractants. 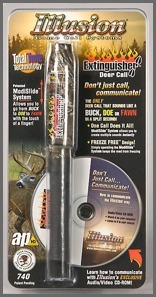 The "Extinguisher" Deer Calling System is the only deer call that sounds like a Buck, a Doe and a Fawn in an instant. The "Extinguisher" received a 99.6% approval from the NAHC Field Test, highest ever by a deer call! 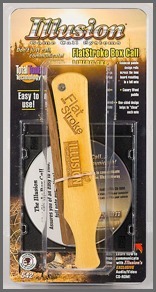 The "Flat Stroke" Custom-Cut Box Call is individually hand tuned. This call has one of the most extreme ranges of tones and volumes. From incredable soft subtle finsishing yelps to extreme penetrating yelps that will amaze you! Made from solid black walnut and canary wood paddle. Packaged with video CD-ROM instructional. Each call has consistant performance with a unique look and feel. 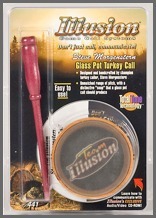 Turkey Pot Call System Glass. This custom pot call will blow you away! Developed by turkey hunting fanatic and US Friction Open Champion Steve Morgenstern, it has the power, range, and snap that the obsessed callin' man wants to hear. 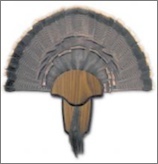 Turkey Tail and Beard Mounting Kit. Mount the trophy yourself, save money and get it up on the wall faster. By far the most advanced and easiest to use turkey call ever made. Xtreme Scents Scent Eliminator Wipes - Great for keeping human odors off your baits, lures and hands and for cleanup jobs after fishing on your boat. Whether you are a tournament fisherman or just a fishing enthusiast, every strike counts. Xtreme Scents Fish Attractant accelerates the movement in inactive fish and increases the number of strikes while fishing.